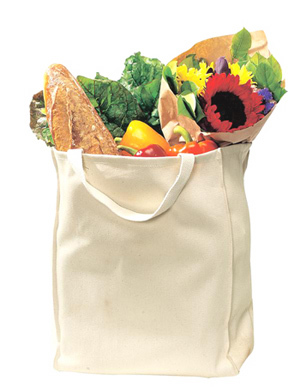 This inexpensive tote has a wide bottom to fit bulky groceries. Four sides offer plenty of room for decoration. | Durable 12-ounce, 100% cotton twill Cotton web handles reinforced with stress-point stitching Dimensions: 15.5'h x 13'w x 7'd Bags not intended for use by children 12 and under.